Listening to birdsong provides a huge amount of pleasure to people all around the world, but which species are the most melodious and produce the best songs? Hannu Jännes has created World’s Best Bird Songs, a beautifully illustrated and very useful book and app combination, bringing together 70 species with the most remarkable voices from around the world. These include the melodious high-quality tunes of the Common Nightingale and Wood Thrush, the splendid mimicry of the Northern Mockingbird and Superb Lyrebird, the far-carrying ‘boom’ of the Eurasian Bittern and the quirky ‘popping’ of the Black-Bellied Bustard. Listening to their performances will provide the perfect inspiration to get out of bed early and take in the next dawn chorus. In-depth guide to some of the most melodious bird songs from across the globe. 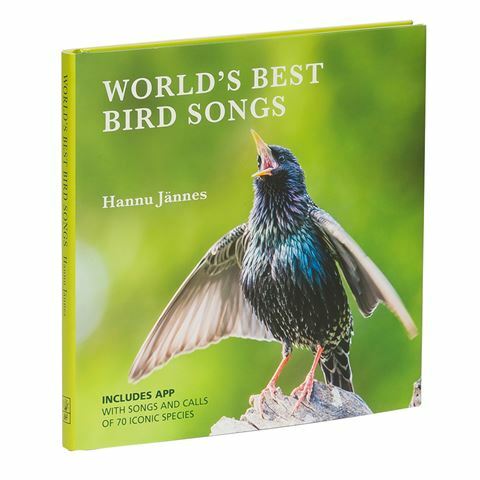 Contains 70 different species, each one providing information on the bird’s physical attributes and habitat, as well as the quality of their bird songs. Comes with an accompanying app – open the app and scan the QR code on each species’ profile to instantly hear their bird song. Begins with an introduction penned by Jännes. Index, sound and image credits at the back of the book. Dimensions: 20cm (l) x 19.7cm (h) x 1.4cm (w).